Let me tell you of an odd little something which happened yesterday. I had friends and fellow members of the House of Netjer here to celebrate Wag Festival with fellowship, heka, and a tour of a local crypt. After finishing our lunch we all came back to my house for more talk, and I was showing some of my assorted Kemetic-themed acquisitions from the last ten years. The last item I picked up was a drinking horn with a Jackal on one side and scarab on the other made by a fellow shemsu-ankh I purchased from him in 2012. I’ve never had a drink from the horn or done much of anything with it since then. It just rests on my shrine. But when I held up the horn to show it, I could hear a sound like something was inside. A little shake and this comes out. I’ve never owned a set of runes which look like this. I contacted the horn’s maker, showed him the photo, and he’s never seen (much less owned) runes which look like that. With some of the happenings this year I’ve been again wondering what to do with and about my witchcraft and connections to the Gods of where my family hails. 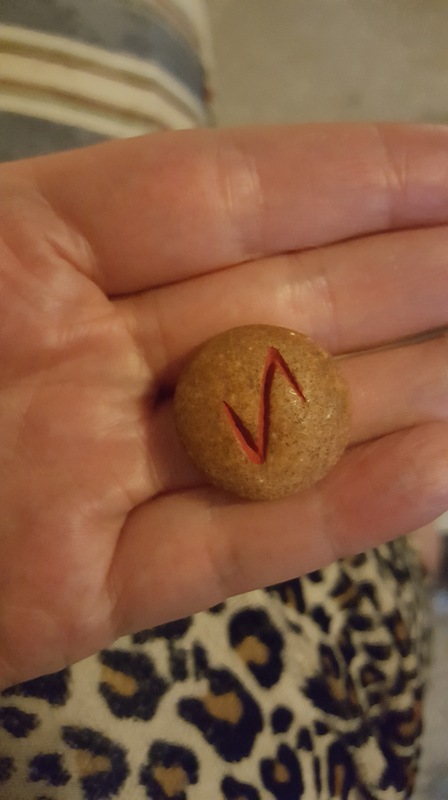 Then I get this and remember someone talking about this rune years ago, and how its shape could be the hooks which connect the worlds together. My brain is also trying to convince me I have somehow had a set of runes like this when I know damn well I have not. I do have a set of runes on yew, as well as on deer antler, and on clear quartz, but that’s it. There is no way this rune could have found its way into the horn by some of my own influence. Sufenas, indeed! Also it’s good to hear from you. I have been meaning to send you an email for weeks and maybe I shall during this one. Saryt, yeah. I’m still a little freaked out by it.